The drive to Sonamarg is through the Sindh Valley which presents yet another spectacular facet of countryside in Kashmir. Situated at an altitude of 2730 m, Sonamarg ('The meadow of gold') has, as its backdrop, snowy mountains against a cerulean sky. The Sindh River that meanders through the valley abounds with trout and mahaseer. Ponies can be hired for the trip up to Thajiwas glacier, which is a major local attraction during the summer months. Sonamarg is the base of a major trek that passes along several mountain lakes -Vishansar, Kishansar, Gadsar, Satsar and Gangabal. Sonamarg is also the take off station for the drive to Ladakh across the Zojila, a major pass in the Great Himalayan Range, through which the Srinagar-Leh Road passes. 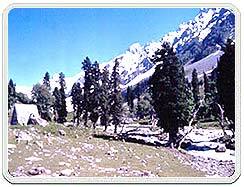 Sonamarg is also a base for undertaking the yatra to the holy Amarnath cave, during Sawan Purnima. 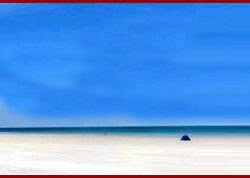 For details about the yatra, refer to the Amaranathji Yatra Link. Accommodation in sonamarg is available in J&K TDC's Huts and Tourist Bungalows. The tariff is Rs. 1400/- for 2-bed room huts and Rs. 300/- per double room in Tourist Bungalow. 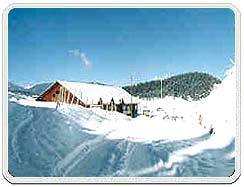 In addition, there are some private hotels, among which the Hotel Glacier is the best known. 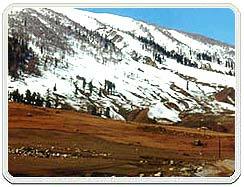 Sonamarg mainly offers trekking adventure. Trekking can be undertaken to Thajiwas Glacier which is very beautiful. Sledging at the frozen Glaciers is also offered by locals. You can take long walks in the jungles and explore rich lora and fauna. Alpine Skiing is also available at high altitudes. A Popular trek from Sonamarg to Pahalgam can also be undertaken. 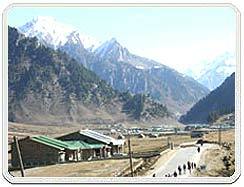 The Tourist Office at Sonamarg is within the premises of the Tourist Complex, behind the cafeteria. Tourists are advised to visit the office for information and assistance. In particular, trekking trips into the mountains should be undertaken only after consulting the Tourist Office at Srinagar or Sonamarg for safety and feasibility.